Cities across the globe marked the day with vivid displays of awareness for AIDS that has infected 60 million people. 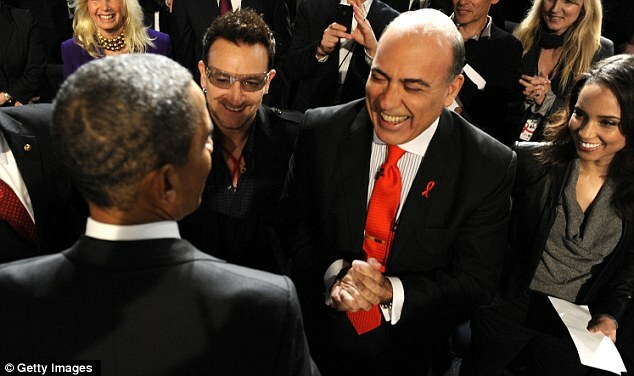 'We can beat this disease,' Obama declared during a World AIDS Day event in Washington. Former Presidents George W. Bush and Bill Clinton also participated via satellite. President Obama pledged to help give 6 million people antiretroviral drugs in the countries hardest hit by the disease by 2013, increasing the original US goal by 2 million. And he announced plans to boost spending on HIV treatment in the US by $50 million. 'The rate of new infections may be going down elsewhere, but it's not going down here in America,' he said. As part of Obama's new overseas initiatives, the US will also aim to get antiretroviral drugs to 1.5 million HIV-positive pregnant women to prevent them from passing the virus to their children. He also plans to distribute more than 1 billion condoms in the developing world in the next two years and fund 4.7 million voluntary medical male circumcisions in eastern and southern Africa. Research shows circumcisions reduce the risk of female-to-male HIV transmission by more than 60 percent. The new global goals build on the work of the President's Emergency Plan for AIDS Relief, which focuses on prevention, treatment and support programs in 15 countries hit hardest by the AIDS pandemic, 12 of them in Africa. President Bush launched the $15 billion plan in 2003, and in 2008, Congress tripled the budget to $48 billion over five years. President Obama praised his predecessor for his leadership on AIDS relief, saying the program will be one of the former president's greatest legacies. 'That program — more ambitious than even leading advocates thought was possible at the time — has saved thousands and thousands and thousands of lives, spurred international action, and laid the foundation for a comprehensive global plan that will impact the lives of millions,' President Obama said. 'Countries that haven't made a pledge need to do so,' he said. President Obama ordered his staff to reevaluate both their international and domestic approaches to HIV and AIDS this summer after being briefed on the scientific advancements. 'Here's what we can do when we work together. We've got leaders of both political parties standing behind something that works,' said Gayle Smith, President Obama's senior director for development and democracy at the National Security Council. 'The only way to undermine this historic undertaking is if it becomes a partisan issue,' he said.